This year thirty five cars entered the Dales Trail which was a good turnout for our small club; in addition to our members we had we had members of the MGOC from the Leeds area and cars from as far afield as Nottingham. The Dales Trail is based at Romanby Golf Club Northallerton; we line the cars up around the club house so they can be inspected by the golfers as they arrive to tee off. We do a circular route back to the golf club and line up again on the lawn for the presentations. The Dales Trail is our main charity event of the year, this year our chosen charity is the Pendragon Trust which is a Northallerton based Charity which provides support to the lives of people with physical difficulties, emotional difficulties, mental health issues, learning difficulties and their families and carers. The specialist centre provides a range of sensory equipment and sensory experiences including: therapeutic, respite and relaxation and developmental opportunities. The centre has a large studio based specialist multi- sensory environment for groups of up to 14 in number and a smaller environment for more personalised use by up to 2 clients. Members enjoyed a coffee and bacon butty in the club house whist they were registering; we had a second hand book stall and a raffle to help raise funds. We have enjoyed a record summer in 2018 equalled only by the summer of 1976 but the weather turned rather autumnal a few days before the Dales Trail was scheduled and there were a lot of worried YDCCC members. However fortune smiled down on us and on the morning of the run the sun was out; the car hoods were soon down ready for the off at 10.30. It is some 20 miles to the Dales from Northallerton and we have invariably to travel on some familiar flat roads to the foothills. It was therefore great to hear from some of our guests that they had enjoyed driving through the small picturesque villages on the way to the foothills. The route took us on the back roads to Yafforth, Kirby Fleetham, Hackforth, through the deer park to Hornby and on to Hunton we joined the main road at Constable Burton. The Navigators had a rest as we had a straight forward 20 mile run through Leyburn up the Dale to Hawes. This is an ideal spot for a tea break but most crews found Hawes too busy to park, by the time we arrived there were hundreds if not thousands of bikers enjoying the last of the summer sunshine. We pressed on towards Garsdale Head where the Carlisle/Settle railway line crosses the A684. At 43 miles some 15 miles before the Ribblehead viaduct we turned left towards Kirby Stephen. The total mileage of the run was 103miles, it was fitting that we arrived at Pendragon Castle 50.1 miles into the route. Myth has it that the Castle was founded by Uther Pendragon, the father of King Arthur, according to legend Uther Pendragon and a hundred of his men were killed here when the Saxon invaders poisoned the well. This is all supposition and there is no evidence that there was a castle here before the Normans built their Castle in the 12 Century. The last occupant was Lady Clifford in the 17th Century, after her death the castle fell into disrepair. The next point of interest on the run was Tan Hill reputed to be the highest Pub in England, the route then descended into Reeth. We then skirted the Army Ranges at Catterick Garrison, there were no red flags flying today so there were no tanks to be seen. The last leg was to the market town of Bedale and back to Romanby Golf Club. There was some excitement on the top of the moors above Birkdale on the B6270. Rodney Weston a guest entrant from Otley had broken down, no phone signal up there!! When we arrived there were five members parked at the side of the road with Rodney. His car was overheating, Jim Clark was organising things and members were passing bottles of water through windows, sunroofs and over windscreens. We were leading a group of seven cars and so there was plenty of water on hand. I am pleased to say that Gordon and his wife made it safely back to the golf club. At the presentations Gordon thanked everyone for their assistance; I assume/hope they got back to Otley. Some crews stopped for lunch at one of the many country inns on the route, others had a picnic. My dad and I found an idyllic spot on the banks of the river Swale. The last cars arrived back at 3.00 and were lined up again on the lawn in front of the club house. The presentations were made shortly afterwards. We raised £800 for the Pendragon Trust which I think is a great effort for such a small club. Elaine Averis a Pendragon trustee was on hand to receive the cheque from our chairman Dave Simpson. We asked Elaine to choose one car, from the ones that had taken part in the run that she would most like to take home. 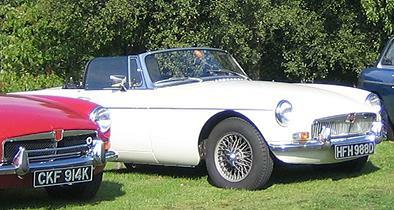 Elaine chose David Lambourne’s white 1966 MGB roadster, David who had travelled from Ilkley was presented with a bottle of wine. 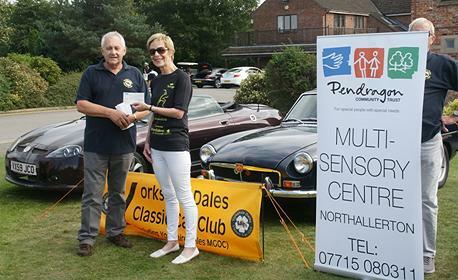 The final presentation was made to the crew who had travelled the furthest to join us on the Dales Trail; the award went by a narrow margin to Gordon Russell who had travelled 110 miles from Nottingham in his MGB. Thanks for all entrants to Bill Burton and Jim Turnbull for their excellent marshalling of the cars, Angela Gill, Kate Simpson and Sheila Mason for manning the stalls and finally Dave Simpson and Tony Mason for planning an excellent route.